A few days ago i was appalled to read that Scott Silverman, from VeriChip, had proposed implanting RFID tags in immigrant and guest workers. During an interview on “Fox & Friends,” he suggested using their RFID implants to register workers at the border, and then verify their identities in the workplace. Meanwhile, California Governor Arnold Schwarzenegger has sent National Guard soldiers to his state’s border with Mexico to bolster security along the Mexican border. Besides, a group of US civilian volunteers that has been patrolling the Mexican border began last week building a fence along a section of the frontier. 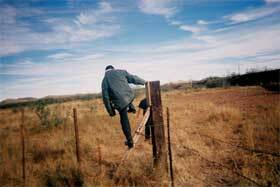 The Minutemen group started erecting the fence on privately-owned land in Arizona on Saturday, saying it is “doing the job the federal government will not do”. 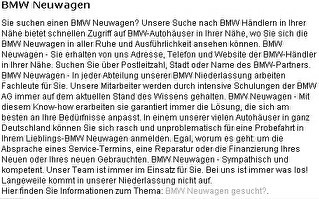 BMW’s German page has been expunged from Google’s search-results, apparently in retaliation for BMW’s use of sleazy “doorway pages” that display different content to search-engine crawlers in order to fool them into valuing those pages more highly. A Google employee has confirmed the “Google Death Penalty” for BMW on his blog. This willingness to punish wrongdoing even when it comes from big companies is a marked contrast with the anti-virus companies that had to be arm-twisted into releasing updates to their products to catch and remove the spyware and rootkits that Sony music was caught distributing on millions of music CDs.